China's sprawling Belt and Road initiative is set to give a shot in the arm for homegrown satellite services providers, which have been gaining competitiveness relative to their foreign counterparts in recent years. And although China has yet to join the top global powers in terms of cutting-edge communications technology, domestic satellite communications firms might turn out to be trendsetters in the future, just like indigenous telecommunications equipment vendors such as Huawei and ZTE, which have gradually upgraded their mobile communication systems over the years from 2G to 5G. In fairness, the use of satellite communications equipment in China - where there is extensive optical-fiber broadband penetration - is relatively limited, unlike in developed markets such as Europe and the US. In these countries, it's common for people to put up satellite dishes, thus making satellite communications equipment almost a daily necessity. In many countries and regions along the route of the Belt and Road, however, there are neither wide-ranging optical-fiber networks nor enough affluence to afford satellite communications equipment and services. Nevertheless, the implementation of the Belt and Road initiative that comprises the Silk Road Economic Belt and the 21st Century Maritime Silk Road still offers a big opportunity for various satellite communications equipment vendors and services providers. To be specific, satellite communications services will be indispensable for Chinese enterprises seeking to build infrastructure in countries and regions along the route where there are no adequate networks on the ground. It's worth pointing out that high-throughput satellites are capable of passing data back and forth between base stations in a fast and efficient manner. There will also be great demand for emergency communications in countries along the route, and satellite communications services are surely among the top choices. In addition, for distance education to be enabled in areas such as African countries, there seems to be no choice other than satellite communications services. On top of that, satellite communications are vital along maritime routes, with vessels such as fishing boats being miles away from land. All this points to the tremendous opportunities that are available, and it makes sense for Chinese satellite communications firms given that Chinese enterprises looking to gain a foothold in markets along the Belt and Road route would naturally prefer to use homegrown satellite communications equipment and services, owing to national security concerns. It should also be mentioned that the offerings of existing satellite communications technologies by indigenous businesses have already come close to being able to match those of their foreign counterparts. The advantage is compounded by the lower prices for homegrown offerings. The countries and regions that can be considered key markets for domestic satellite communications firms are Pakistan, the five Central Asian countries and African countries. Chinese offerings might be more sensitive in countries such as India. Admittedly, China still lags behind developed economies in terms of the capability to invent disruptive satellite communications technologies or make revolutionary breakthroughs. But China's domestic satellite communications firms have been growing at an accelerating rate, and are getting stronger in their research and development capabilities. The rise of Chinese telecommunications equipment vendors could be an analogy for China's future rise in the satellite communications space. Back in the 2G era, domestic firms were generally preoccupied with efforts to imitate and catch up with their global counterparts, but they've now risen to become genuine industry behemoths. The transition from being a follower to a leader is highly likely to be repeated in the arena of satellite communications. 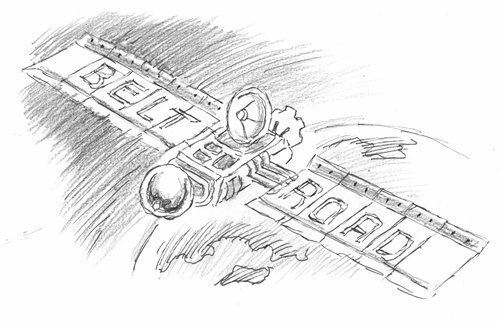 Certainly, it will take time for homegrown satellite communications equipment and services to be well received in markets along the Belt and Road, and they will have to go much further than simply being taken for granted by Chinese businesses envisioning an expansion along the route. But the opportunities along the Belt and Road route could lead to the eventual rise of China's satellite communications strength.